The Angolan Air Force will in May this year take delivery of another two Su-30K combat aircraft from Russia, having already received six out of an order for 12 of the refurbished second hand aircraft. This emerged during the visit to Russia by Angolan President João Lourenço on 3 April, who was in Moscow for the Russian-Angolan business forum. Angolan Defense Minister Salviano de Jesus Sequeira told Sputnik that another two Su-30K fighters are contractually obliged to be delivered in May. “Angola has always had good military cooperation with Russia, within the framework of our contract we have already received six Su-30K aircraft and…we hope that the other two will be delivered to Angola at the end of May,” he said. Angola received its first two Su-30Ks in September 2017, with four spotted in satellite imagery in October 2018. 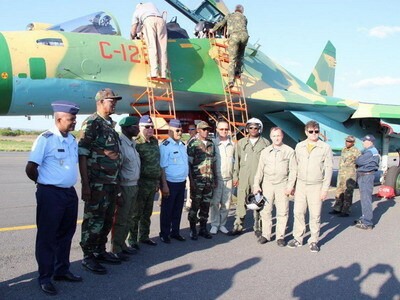 It ordered 12 Su-30K fighters during a visit by Russian Deputy Prime Minister Dmitry Rogozin to Luanda, Angola, in October 2013. Deliveries were originally anticipated around 2015 but delayed due to upgrade work – according to ITAR-TASS, modification work includes improvements to the radar and navigation system and installation of a video recorder, amongst other items. The aircraft were formerly operated by the Indian Air Force, which has ordered more than 200 Su-30MKIs in a number of batches. The early models delivered were basic aircraft without features like canards and thrust vector controls, and it is these 18 early model aircraft (ten Su-30MK and eight Su-30K fighters delivered between May 1997 and December 1999) that were returned to Russia and replaced with more advanced Su-30MKIs. India had intended to upgrade these early aircraft but instead used them as part-exchange for new aircraft. They were retired in 2006 and sent to the 558th Aircraft Repair Plant at Baranovichi in Belarus between August and November 2011 as the property of Irkut Corporation. They were subsequently overhauled and upgraded. On the aviation side, Angola is believed to be getting K-8 Karakorum jet trainers from China, with photos emerging earlier this year showing one of the jets in Angolan Air Force colours. It is not clear when deliveries will begin or what quantities are involved.